LA Salle showcased its depth and talent in overpowering archrival Ateneo, 92-77, on Friday to march to the finals of the Filoil Flying V Preseason Premier Cup. Thomas Torres led the Green Archers with 17 points, Ben Mbala added 16 markers and 17 rebounds, Aljun Melecio scored all 15 of his points from beyond the arc, while Abu Tratter and Andre Caracut contributed 14 and 13, respectively, to arrange the title duel against Arellano on Sunday at the Filoil Flying V Centre. 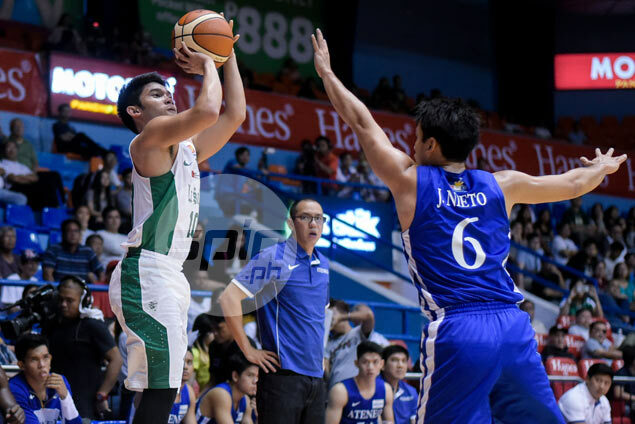 The Green Archers even won despite limited minutes from Jeron Teng, who was still recovering from a sprain in his left ankle he sustained in the semifinals against Far Eastern University. Teng went scoreless but dished out two assists in 15 minutes of action. "Gusto namin mag-trabaho as a team. Gusto namin na as early as now, malayo na ‘yung marating namin para pagdating ng season, mataas na kami," said La Salle coach Aldin Ayo. Unlike in their preliminary match, it was a competitive battle as Ateneo was able to cut a large deficit to single digits in the fourth. But La Salle then unleashed 7-0 run to keep the game out of reach, 83-68. The Green Archers remained unbeaten after nine games entering their finals match against Arellano, which defeated National University, 94-85, in the semifinals. Aaron Black had 24 points for the Blue Eagles, who were without head coach Tab Baldwin who flew to Greece to join Gilas Pilipinas. DLSU (92)—Torres 17, Mbala 16, Melecio 15, Tratter 14, Caracut 13, Montalbo 7, Go 6, Gob 2, P. Rivero 2, Teng 0. ADMU (77)—Black 24, Ravena 10, Wong 8, Porter 7, Tolentino 7, Ikeh 6, Go 4, Asistio 3, Ma. Nieto 2, Babilonia 2, Allmond 2, Mendoza 2, Banzon 0. Quarters: 27-14, 48-40, 66-56, 92-77.